When it comes to choosing a restaurant, it seems good old-fashioned word of mouth is not dead, according to a recent survey by reservation platform SevenRooms. More than half of American diners (54 percent) turn to friends and family for restaurant recommendations. About 30 percent consult review sites like Yelp, and 25 percent were influenced by something they saw on TV, according to the survey, conducted with research firm YouGov. 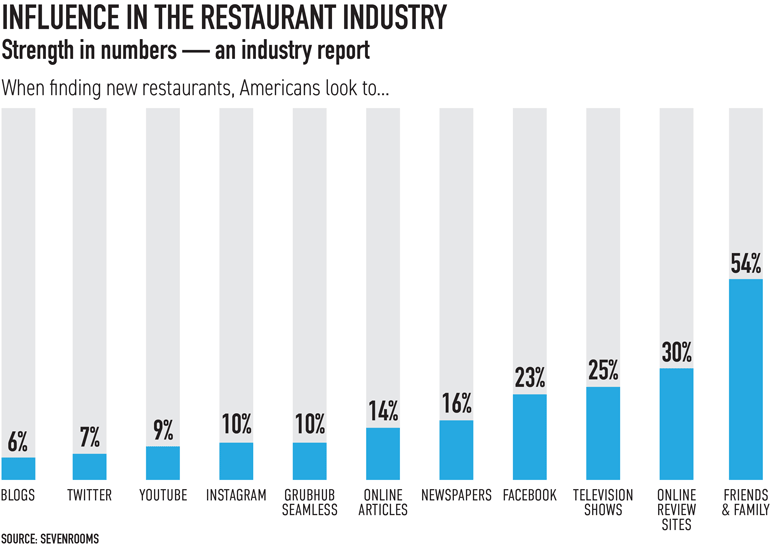 About 35 percent of diners said they have eaten at a restaurant because they saw it on social media. Among those platforms, Facebook had the most influence (23 percent), with Instagram (10 percent), YouTube (9 percent) and Twitter (7 percent) far behind.